Please refer to our stock # SJ0073 when inquiring. 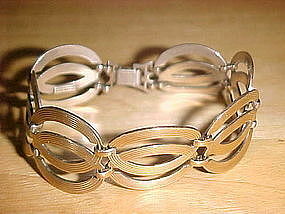 Wonderful 1940's Sterling and 14k double ring linked Ladies Bracelet. This bracelet is signed ' SYMMETALIC STERLING and 14k ' in two places. One signature is found on the end double ring link that connects to the clasp and other signature is on the clasp. This bracelet is in fine condition with minor scratches and measure 7" long and 7/8" wide. Each of the seven sterling links actually has a layer of 14k gold fused on to it.